In 1766 the Dolphin, a ship commanded by Commodore John Byron (nicknamed "Foul-Weather Jack" and grandfather of the poet Byron) returned to London from circumnavigating the globe. While it lay in dock, a rumor leaked out that the crew of the Dolphin had encountered a tribe of nine-foot giants in Patagonia, South America. This rumor first appeared in print on May 9, 1766 in the Gentleman's Magazine. Other newspapers, such as the London Chronicle, then picked up the story. The 1766 rumor soon gained widespread acceptance, its credibility bolstered by the fact that it built upon a large number of earlier accounts of Patagonian giants. For instance, Antonio Pigafetta, who sailed with Magellan in the 1520s, had written of an encounter with a race of South American giants. According to Pigafetta, Magellan referred to these giants as 'Patagons' because of their big feet, and so the southern tip of South America came to be known as Patagonia. In 1578, Sir Francis Drake's ship chaplain, Francis Fletcher, also wrote a manuscript that described meeting very tall Patagonians. 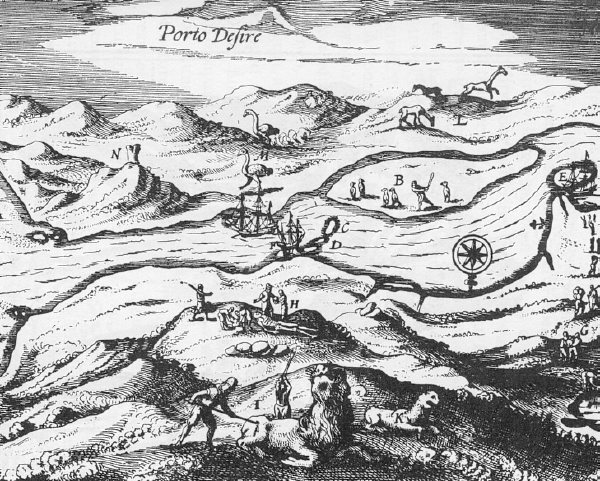 In the 1590s, Anthonie Knivet, who had sailed with Sir Thomas Cavendish, claimed that he had seen dead bodies in Patagonia measuring over twelve feet in length. A long-running scientific debate also gave fuel to the rumors of a race of South American giants. The great French natural philosopher, Georges-Louis Leclerc, Comte de Buffon (1707-1788) had argued that animals and plants of the New World were small and degenerate in comparison to their European counterparts (this was before Europeans had done much exploring in the Americas). Buffon's opponents seized upon and promoted the rumors of South American giants in order to prove Buffon's theory of New World degeneracy wrong. Engraving from the East and West Indian Mirror, 1619. In the center, a group of Dutch sailors gazes down into the grave of a giant supposedly unearthed in South America in 1615. 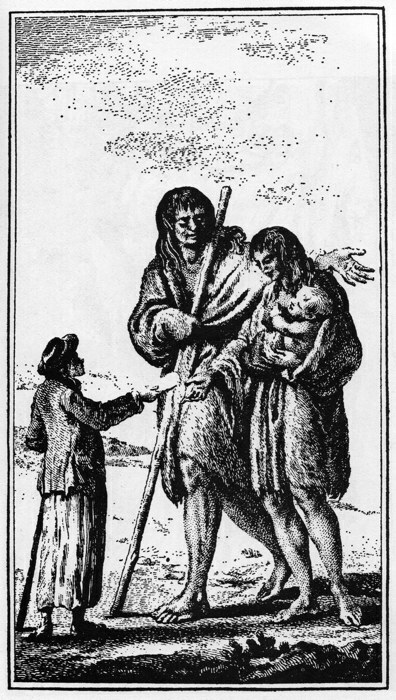 The 1766 report of Patagonian giants encountered skepticism from some quarters. The Journal Encyclopedique printed a letter from M. De La Condamine arguing that the report was a hoax spread by the English. He suggested that the English wanted to send another expedition to Argentina in order to exploit a mine recently discovered there, and that the Giant story was their cover story for doing this. Horace Walpole also wrote a satirical piece titled An Account of the Geantz recently discovered, addressed to a friend, in which he suggested that Byron should have sent some of the Patagonian women back home to England in order to be used to improve the English breed. Despite these notes of skepticism, widespread belief in the rumor persisted. The rumor of Patagonian giants was only definitively proven to be fictitious when the official account of Byron's voyage appeared in 1773. This account revealed that Byron had indeed encountered a tribe of Patagonians, but that the tallest among them measured only 6 feet 6 inches. In other words, they were tall, but not 12 foot giants. The tribe that Byron met was probably the Tehuelches, who were wiped out by the Rocca expedition in 1880. Adams, Percy G. Travelers and Travel Liars: 1660-1800. University of California Press. 1962. Chapter Two. Not that this will convince anyone. There also aren't any dragons, mermaids, harpies, sirens, or a big dropoff at the end of the world. And asian women aren't designed horizontally. There are, however, flying fish and gigantic squid so not everything turned out to be bogus. um, this is NOT a hoax. There is a museum in Argentina that holds the skeletal remains of some patagonians and was featured on the discovery channel. You can search at google, and see that during many centuries, people who visited the south of argentina claimed that they saw very tall people. Darwin says in one of his books (page 245 http://darwin-online.org.uk/converted/scans/1890_Voyage_F59(online)/1890_Voyage_F59_282.jpg)http://darwin-online.org.uk/converted/scans/1890_Voyage_F59(online)/1890_Voyage_F59_282.jpg) that their average height was about six feet. With some man taller and only a few shorter. That is pretty tall, and I think that they had lost some inches due to crossbreeding in 1830 when Darwin saw them, and thats why the first people that saw them sayed that they were giants. Thats my opinion. Good bye. There were certainly exaggerations, but I stand fully convinced there were some individuals among those tribes who would have made Yao Ming look like a 12 year old boy.